When I saw the prompt “Maiden Aunt” I immediately thought of Catharine “Kate” Rowley. She was one of eight or nine children born to Erastus Rowley and Mary Annable (4th gr-grandparents), and she outlived all her siblings, despite the handicap of blindness. Erastus Rowley was a butcher, born and reared in Shelburne, Chittenden County, Vermont.1,2 He married Mary Annable in 1813 in Shelburne.3 Mary was a Canadian citizen. Her father, John Annable, moved to America shortly before the Revolutionary War and went to fight on the British side. After the war, he received bounty land in Ontario (then still part of Quebec). Mary Annable Rowley (Courtesy of Nancy Ingram). Fortunately, the Rowley family liked to have photographic portraits made. Kate was born 12 Sep 1826 in Shelburne.6 The family story is that she fell on a knitting needle at the age of eight and the resulting infection eventually blinded her in both eyes.7 Unfortunately, I have not been able to corroborate this story, though it certainly may be true. Another family story is that Kate was engaged to be married, but her fiancé died before the wedding could take place.10 I tend to think of this as a tragedy for a young woman, heartbroken at the loss of her love. But, who knows? Maybe sightless Kate was being foisted on a willing suitor to care for her, and his death might have saved her from a miserable marriage. Could go either way. Kate was still living with her parents in 1850, at the age of 23.11 By 1860, she had moved in with her sister, Laura (Rowley) Spear.12 Laura’s husband was Daniel L. Spear and they had three daughters and a son (born in 1861). Though her status in the census records is given as “domestic servant,” Kate was probably just treated as one of the family, which she was. I imagine she enjoyed experiencing the growing years of her nieces and nephew. Haha that’s funny I’m sure they would never even imagine what we do nowadays! They had to spend so much time merely surviving. Facebook? Ha! 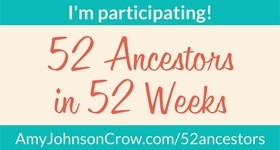 Someday it will be on my genealogy travel agenda. Interesting story, especially with your inclusion of what might have happened to Kate if she had married. People lived such different lives than ours now. I sometimes hesitate to speculate like that, but I think it brings the person closer to real. Very interesting. Reading this biography makes me wonder about how Kate lived out her day-to-day life. The census records only reveal so much, and leaves much to the imagination… Loved reading your speculations about what might’ve been.